Reference number for this case: 20-Oct-54-Chevenon. Thank you for including this reference number in any correspondence with me regarding this case. An article in the regional newspaper La Liberté, of Clermont-Ferrand, France, on page 2, for October 22, 1954, mentionned that in Chevenon, near Imphy in the Nièvre, Mr. Guy Chevrier, with three people, had lenghtily seen a kind of very luminous rocket that crossed the sky at high speed. - Yes, it was in the direction of Bourg-Lastic, or on the train station of Laqueuille. We saw a strong red gleam which seemed to come from a small wood at 500 meters of us approximately. It is rather difficult to evaluate a distance by night. First of all we believed it was a forest fire. I slowed down the truck to try to locate what we believed to be a fire in order to raise an alarm in Laqueuille. We drove gently a few tens of meters more, and at this point in time in a clearing, down the left side of the road, we saw a disc or a ball, producing an intense light, like the raising sun. The two authors and ufologists indicate that on October 20, 1954, in Chevenon in the Nievre, a disc leaving a luminous trail behind itself was seen. The two authors indicate no source and no additional information. 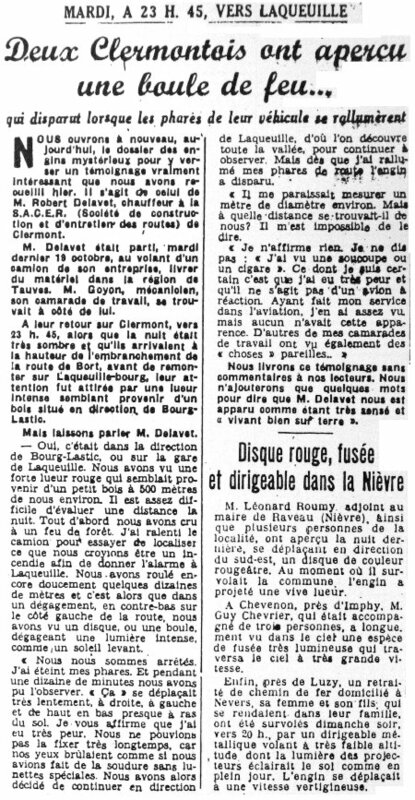 Luc Chastan indicates that in the Nièvres [sic, Nièvre]in Chevenon on October 20, 1954, at 08:45 there was an "Observation of a disc leaving a luminous trail behind it." 1.0 Patrick Gross January 21, 2009 Conversion from HTML to XHTML Strict. First formal version. Additions [ll1]. 1.2 Patrick Gross March 20, 2017 Addition of the Summary. Explanations changed, were "Not looked for yet. Could have been a meteor."